And another marcher, who turned up later in the evening, as protesters became more boisterous. I was with a friend making our way through the heaving streets. 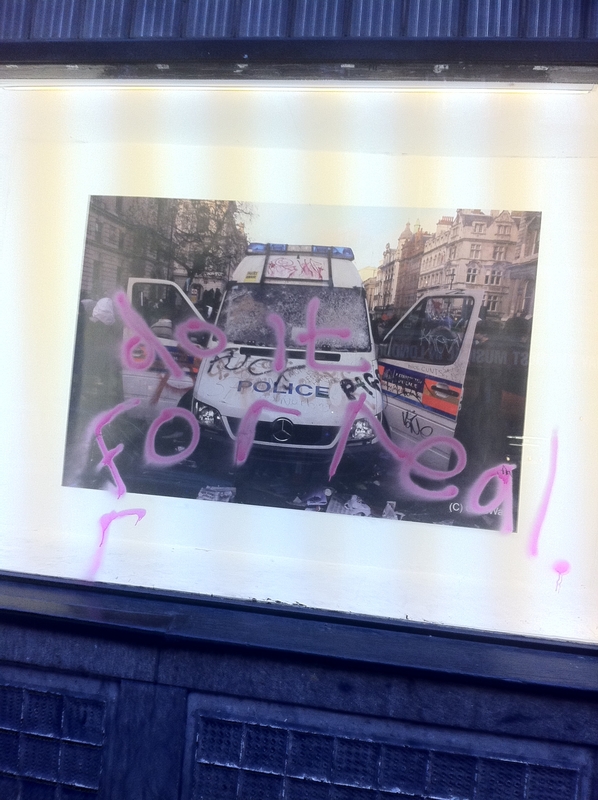 We took some pictures, a couple of interesting graffiti shots with staunch anti-establishment overtones. They were taken on a Iphone 4, and I give them to you as protest (ha) to my developing commitment to delve into mobile reportage. Enjoy. This was carnage. But ultimately achieved nothing really. Idiots. Good vids though…. You need more footage with flinging fire extinguishers, followed by images of the teenage culprit so he/she can be indicted further down the line and never be allowed into university. What are journalists using their mobile devices for?